Ask your children what they got for Christmas last year, the year before or the year before. How much do they remember? Ask them about a family vacation you took & listen as the memories take flight. Minimum 3-night length of stay. To ensure delivery of special gift box and MagicBands by Dec. 15, 2017, claim your reservation to your personal My Disney Experience account and verify your mailing address by Dec. 1, 2017. 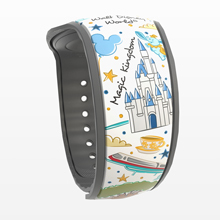 *This limited-time offer includes a special Walt Disney World MagicBand and gift box. To receive these items in home by Dec. 15, please create or sign into your My Disney Experience account at: StartYourDisneyExperience.com, link your Resort package reservation, verify your address and personalize the MagicBands no later than Dec. 1, 2017. My name is Melissa and I am a Disney fanatic; I’m also a travel agent. You will find me on most weekends, with my family in a Disney park exploring everything that Disney has to offer so I can help you plan your own magical vacation. If you would like to reserve this offer and have these special MagicBands under your tree for Christmas, contact me today! Rooms are limited! Purple is now available as one of the eight colors that Guests with an upcoming Walt Disney World® Resort reservation can choose when placing their complimentary MagicBand order via StartYourDisneyExperience.com/My Disney Experience. If you have already personalized their MagicBands on My Disney Experience, but have not yet submitted their order, you can log in to tyour account and edit your MagicBand color selection. In addition, if you are traveling on a Walt Disney Travel Company package, that includes Disney’s Magic Express, you will receive a purple luggage tag when you opt for a purple MagicBand. WDW luggage tags to match the color of your MagicBand. My name is Melissa & I am a hoarder of Disney memorabilia, like these luggage tags. I am also a Travel Agent. If you would like FREE booking and planning assistance from a seasoned Disney veteran, contact me today for your free, no obligation quote.